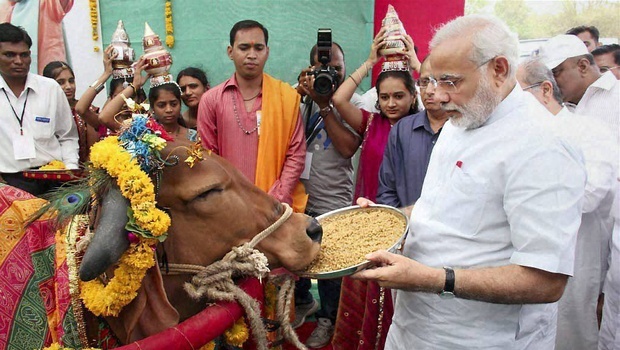 Why was The Cow a Sacred Animal for the people of India? 1. In Hinduism, the cow - a symbol of abundance, purity, holiness, and is regarded as sattwic (blissful) animal. Flowers (especially the lotus), fruit, or any vegetarian meal suitable for offer to God in Hinduism. Among the animals - a cow, which represents the mother. Also, cow's milk, provided that the cow found in natural conditions, it is healthy, and that the milk was obtained only after her calf was fed. If a cow mistreated, drinking her milk is considered sinful action. 2. The vast majority of Hindus adhere to a vegetarian lifestyle. Cow's milk - is one of the main elements of vegetarian food in India. The cow gives milk to man, as well as the mother's milk feeds the child. 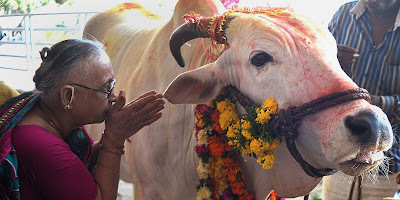 In India the cow is associated with the mother, and the bull - a symbol of dharma. The word "dharma" is literally translated as "that which holds or supports" (from the Sanskrit root Dhar - "support"). Depending on the context, dharma can mean "moral values", "religious duty", "the universal law of life" and so on. N.
3. In the ancient Indian agrarian society and the social significance of a man's wealth was measured quantity of cattle. The cow was a means of payment, dowry, and even used as state tax payments. In ancient times the Indians were mostly shepherds or farmers. Indian society has historically depended on milk and milk products and cow dung used as fertilizer and fuel. Now in Goa and all over India people collect cow dung mixed with straw, dried it in cakes and used as firewood. Cow dung in India and is used as a fertilizer and as a building material (manure mixed with clay). 4. In the Vedas (Hindu sacred scriptures) a special place is given to the blessed cows. Many myths, legends, mantras and songs tell of the special place that occupies in the universe Mother Cow ( "Gau Mata"). Residents of India sincerely and firmly believe in the Vedas and in folk art. doubt. But really, who can say for sure or prove that such was not, or was somehow wrong. The ancient scriptures of India described the cow's milk as Amrita, literally "the nectar of immortality." There are many mantras (prayers) in all four Vedas, which describe the importance of cows and cow's milk not only as a perfect food, but also as a medicinal drink. Rig Veda says, "Milk Cow - this is amrita ... so protect the cows." Aria (pious people) in their prayers for freedom and prosperity of the people praying and the cows that give milk a lot for the country. It was said that if a person has a food, it is rich. Curd dahi (made from cow's milk) and ghee (clarified butter dehydrated) - this wealth. 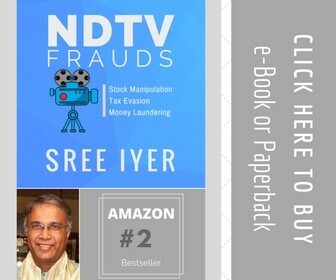 Therefore, in the Rig Veda and the Atharva Veda have prayer asking that God has provided us with such a quantity of ghee to our home was always an excess of this very nutritious product. The Vedas describe ghee as the first and most important of all food products, as an essential component of the sacrifices and other rituals, because thanks to them it rains, and growing grain. Atharva Veda underlines the importance and value of ghee, in other parts of the Vedas ghee is described as a perfect product that increases the strength and vitality. Ghee strengthens the body, used for massage and helps to increase life expectancy. The Rig-Veda says: "Milk was first" cooked "or" processed "in the cow's udder, and after it was cooked or processed in the fire, so Dahi made from this milk is really healthy, fresh and nutritious person performing heavy. the work must have dahi at noon, when the sun siyaAtharva veda says that the cow through the milk, makes the weak and the sick person energetic, ensures the viability of those who do not, so making the family a prosperous and respected in a "civilized society." this indicates that good health in the family was an indicator of prosperity and respect in the Vedic culture. the mere material wealth was not a measure of respectability, as is happening now. in other words, the availability of large amounts of cow's milk in the household has been accepted as an indicator of prosperity and social status. It is important to know that there is a certain time prescribed for reception of milk in order to treat diseases and normal functioning of the body. Ayurveda is the ancient Indian treatise on harmony of body and soul he says that the time for the reception of milk - this dark time of the day and to take the milk have to be hot or warm; well with spices for the regulation of the doshas (kapha, vata and pitta), with sugar or honey. Chharak Shastra is one of the oldest books in the history of medical science. Sage Chharak was an outstanding Indian doctor and his book is followed to this day those who practice Ayurveda. Chharak describes milk as follows: "Cow's milk is tasty, sweet, has a wonderful fragrance, dense, contains fat, but the light, easy to digest and not easy to go bad (it is difficult to poison) It gives us peace of mind and joy of life.". In the next verse of his book he says that because of the aforementioned properties of cow's milk helps us to maintain the vitality (Ojas). cow is god for us let it live, I worshiped it I god blessed for my life.